This day, fifty years ago, Martin Luther King Jnr was assassinated. He has become most famous as a civil rights activist, who used civil disobedience and non-violent resistance, to end racial segregation. What is often overlooked is his desire to abolish poverty, both within and between nations, by the expedient method of a guaranteed minimum income. 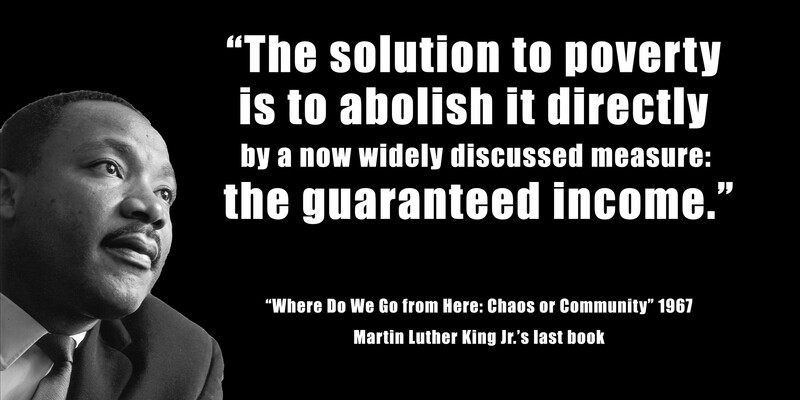 Martin Luther King Jnr, like many before him, advocated a guaranteed annual income on the basis of justice. This is a good moral reason, inspired by both the rumbling discontent and misery by the impoverished, and the empathy and humanity felt by the well-off who witness the visceral suffering of their fellow human beings. "Now one of the answers it seems to me, is a guaranteed annual income, a guaranteed minimum income for all people, and for all families of our country. [crowd applause] It seems to me that the Civil Rights movement must now begin to organize for the guaranteed annual income." But a guaranteed minimum income also satisfies criteria of administrative efficiency and economic effectiveness. It also acts as means to provide all adult members of a household economic independence. In addition, it provides a means to provide a technological dividend to all citizens, alleviating the problem of technological unemployment. Studies show that a basic income is simpler and more transparent than the bureaucratic administrative burden and punishment of existing welfare systems. A guaranteed minimum income provides a sustainable level for recipients to afford the costs required to effectively participate and contribute to society. As a result, rather than reducing the desire for employment, it can actually increase it, leading to a net benefit in economic activity and greater wealth for all. Of course, a guaranteed minimum income must be paid for. It cannot be paid for by simply providing more money, as that will just create inflation and the purchasing power of the poor will not change. It should not be paid for by distributing income from productive work and investment, as that will reduce our aggregate wealth. Rather it must come from economic rents, the value of our common resources, those gifts of providence provided to all, but which are appropriated by monopolistic behaviour. Across the political spectrum, voices are being raised to introduce a guaranteed annual income, such as Dieter Althaus in Germany and Yanis Varoufakis, in Greece. Economists like Ailsa McKay, Angus Deaton, and Christopher A. Pissarides recognise its value. Technologists like Tim Berners-Lee, Mark Zuckerberg, and Elon Musk recognise its value. Sociologists like Carole Pateman, Antonio Negri, recognise its value. On the fiftieth anniversary of his death, the time has come - indeed overdue - to fulfil Martin Luther King Jnr's other dream: End poverty now with a guaranteed annual income. If not now, when? If not by us, who? Policy statement of the Isocracy Network., posted 18:01 Memphis TN time, April 4, 2018. Commenting on this Story will be automatically closed on June 5, 2018. Europe’s first national government-backed experiment in giving citizens free cash will end next year after Finland decided not to extend its widely publicised basic income trial and to explore alternative welfare schemes instead. The government has turned down a request for extra funding from Kela, the Finnish social security agency, to expand the two-year pilot to a group of employees this year, and said payments to current participants will end next January. The above policy statement states that minimum income "must come from economic rents, the value of our common resources". In Martin Luther King Jnr's final book, Where Do We Go From Here? Chaos or Community, he references directly from Henry George's Progress and Poverty.